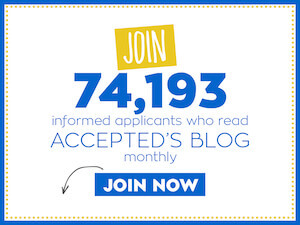 Accepted.com is continuing a blog series featuring interviews with current MBA students, offering readers a behind-the-scenes look at selected MBA programs. We hope to offer you a candid picture of student life, and what you should consider as you prepare your MBA application. Here are some excerpts from an interview with a current NYU Stern part-time MBA student from a marketing background. What’s the best way to plan for the part-time Langone MBA program so you get the most out of it? Get your employer on board because you need a lot of flexibility. A major part of the MBA is not just class, it’s about events. For example, Stern might have a venture capitalist talking about how to start a business at lunch time, or 4 pm. And you might want to attend clubs that meet during work hours. How did you get your boss on board? What about managing your time to get the most out of the experience? I think it’s very important to get involved early if you want to make a good network It’s better to hang out with people early on because that’s when people start forming their groups, otherwise it’s harder to break in. I went for two semesters in Westchester, so if you really want to be involved you have to go to the city. There you’re better off because you can meet more people. I got involved in the social enterprise club which is great and aligns with my post-MBA goals. How close did you stick to your originally stated goals from the application? In my application, I mentioned that I want to stay in my current job and industry. That’s truly what my thought process was. But when I joined school I met people doing different things, and started thinking about going in a new direction. I’m in the process of figuring out where I want to be. I wouldn’t say I’ve made a drastic shift, but I’ve made a shift. I can still use a lot of things that I’m doing now in my next career. I think that I’ll be going towards consulting or product management. What classes and professors have been the most interesting? The strategy and marketing courses. Strategy with Marciano and Marketing with Jeffery Carr. What about the New York location? How did that affect your experience? The NYU website says you’ll have access to a lot of leaders and that’s really true. You have a lot of good speakers pass through campus. What about part-time vs. full-time? Do you think you’re making any compromises in your experience there? Most of the professors are the same, so the quality of the curriculum is the same. Career services I would say is for full-time students, as they are more focused on the full-time people who are going out looking for jobs. The general perception is that part-time is for people who want to keep working in their industry. It’s not geared toward people who want to make a career transition. But if you want to make one, they will help you. Were you able to apply what you learned in real time? I would say so far the courses taken have been very broad. I wouldn’t say I’ve applied everything, more like 30 to 40 percent of what I’ve learned. But there have been some “aha!” moments where I’ve been able to contribute at work. What kind of leadership training or mentoring have you received? I think the best training I’ve received is from my peers. There are people who are second or third year in the program who can tell you how to approach looking for a job, or these are the great classes to take. I know NYU has a lot of programs where you can engage the faculty, take them out to lunch–especially for entrepreneurs–the faculty is very receptive. How much time would you say you dedicated to school each week? About 6 hours in class and then I dedicate 12 hours a week to studying and events. What do you know now that you couldn’t glean from the website or admissions events? The part-time program is very finance heavy. A lot of students are from the banking industry. It can be a little difficult for someone not in finance trying to make a transition meeting people who are non-finance. Best day? I attended a global business conference arranged by one of the clubs and that was really good for me because I met a lot of people from across the world. My interest does lie in emerging markets and I met people from India, like heads of banks. Worst day? A class on Saturday from 9 am to 4 pm. By Michelle Stockman, who worked in the Columbia Business School admissions office, has a Masters in Journalism from Columbia, and has assisted Accepted.com clients applying to top business schools since 2007. When not advising Accepted’s clients, she is a multimedia producer with works published by Agence France Presse, Economist.com, WSJ.com, The Times of India, and Hindustan Times. She is happy to help you with your application. Last updated on November 22, 2011.